Norway is a very beautiful and original country, which can boast of interesting history, rich culture and picturesque nature. 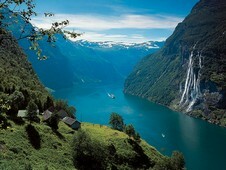 This is just nature, which is the Norwegian main sight. Extremely beautiful and pure lakes, water falls, which give you a thrill, and world-class alpine skiing resorts attracts a large number of tourists. Every year, a few millions of travelers visit the country. In order for your rest to be entirely full-fledged, you undoubtedly need a car. You will not have to depend on the public transport schedule. In order to save time, it is necessary to rent a car straight at the airport. It is recommended to take care of care hire beforehand, using an extremely reliable service bookingcar.ru. Just fill in the application form, and the specialists will take care of everything. You will get a car right upon arrival. What is necessary to know in order to hire a car? There is politeness and order on Norwegian roads. That is why all trips will bring you only positive emotions. However, in order not to get into hot water, it is necessary to learn all peculiarities of the automobile world in Norway beforehand. It will not be odd to learn how to pay at fuel stations, where to park a car as well as other important things necessary for drivers. It is not advised to risk. In Norway, the policemen often make ambushes. At that they wear civilian clothes and can use a car without any identification signs. The speed rate in Norway is a bargain. That is why it is strongly not recommended to go over the speed limit. What is more, there is no difference whether you have exceeded the speed limit by 5 or 50 km/h. The sum of fine will always be similar. The speed shall not be more than 100 km/h on express roads. In Norway, there are a large number of speed guns installed in the most unexpected places! There are a large number of parking lots in Norway. Most of them lots are paid. The average price for one parking hour is 3-4 Euros. The average price outside population centers is 1 Euro. It order to pay for the car park, it is enough to just purchase a parking voucher at a special machine and fasten the voucher under the windscreen. Parking machines accept only local currency in cash. When going to Norway, it is necessary to remember a few aspects of the road traffic regulations. In Russia, the policemen do not pay great attention to these moments. In Norway, these aspects often result in the imposition of a fine. When driving on neighborhood roads, always follow the speed rate. Under no circumstances can your speed be more than 30 km/h. The road traffic regulations in Norway require to turn the dim lights on every time your drive a car. It does not mean what time of the day and season it is. There are a surprising number of sleeping policemen in Norway. They are located almost everywhere. At that they are oftentimes not marked. That is why be careful on roads. There are quite many fuel stations in the country, especially near highways. That is why you will not have problems will fuel. There is other goods news for forgetful drivers. It is permitted to carry up to 40 liters of fuel in cans. The price for one liter of diesel fuel is 1.75 Euro. At fuel stations, it is possible to pay both in cash and by credit card. There are practically no automated fuel stations in the country. When booking a car in Norway, do not forget there are more than 45 toll roads in the country. It is possible to use two payment methods, i.e. in cash and by credit cards, when paying for passage practically on all roads. However, there are exceptions. There exist a few roads where you will manage to pay for the passage in cash only. There is another important fact which all tourists, who are going to travel along Norway by rented car, ought to know about. A large number of roads are closed in autumn and winter period. That is why carefully plan your route before any trip, correct it and think about alternative variants if necessary. Oslo from 36 eur a day.